The Middle Eastern country of Oman is getting increasingly popular with tourists lately, but I still don’t think it gets the credit it deserves. This Arab country has some incredible sights that range from historic castles to desert canyons and rocky mountains. Oman is also a very safe place to travel, with one of the lowest homicide rates in the entire world. Hopefully these pictures of Oman inspire you to visit! Did you know there’s a “Grand Canyon” of Oman? Here’s what it looks like. This canyon may not be as big as the one in Arizona, but the scale is still amazing. See that tiny foot path winding along the edge of the canyon? The countryside of Oman is full of old castles and towers like this. Fish for sale at the Nakhl-Barka fish market in Rustaq. An Naman Castle is a seaside fort built in the 17th century. This is another nameless tower I passed on a drive through the countryside. Rustaq Fort has some pretty impressive walls and towers. You can walk along the inside of this wall at Al Hazm Castle. The souq (market) at Nizwa has a lot of interesting souvenirs. Clay pots for sale at the Nizwa market. Camel X-ing! You’re likely to see some camels during your time in Oman. Al Hazm is another fort that was built in the 18th century. Oman may not be known for mountains, but it has them! Red, white, and green. The flag of Oman is an easy one to remember. Another interior shot from inside the walls at Rustaq Fort. 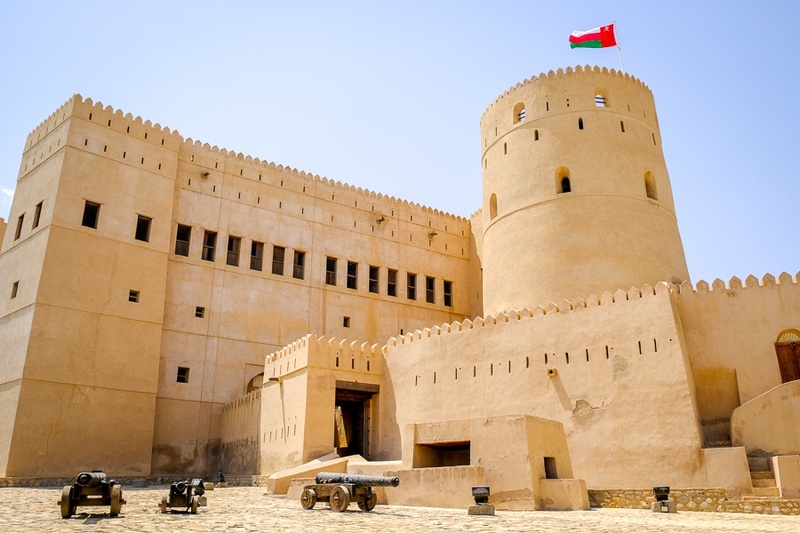 Nakhal Fort was probably my favorite castle/fort in Oman. This is what the living quarters look like. A view of the mountain landscapes as seen from the fort. The rooftop gives you some incredible views of the surrounding area. A desert town and an oasis of palm trees. The top of the fort is lined with old cannons. Desert lizard! You see lots of these in Oman. The mountains look even more incredible when you start to get up close to them. Impressive walls at Nakhal Fort, huh? Walking through a mysterious looking hallway inside the castle.